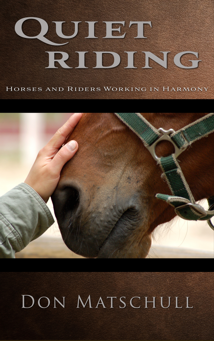 How you tack up your horse is an important aspect in building a relationship with your horse. How you treat your horse will influence how willingly he responds to you. If you are abrupt and impolite, throwing a saddle on his back and shoving a bit in his mouth, you should not expect your horse to look forward to working with you. I consider proper saddling and bridling a matter of being polite to the horse. First, make sure the horse is properly groomed. You don't need to spend hours brushing and washing your horse, but you should at least make sure the areas where the tack contacts the horse are brushed clean of any dirt or other foreign material which might cause discomfort. You wouldn't want to perform with a stone in your shoe. Be sure your horse's feet are clean. Even if there is no stone in the shoe (or hollow of the foot if the horse doesn't wear shoes), a buildup of mud can make the horse unstable. This would be like trying to perform in platform shoes. Place the saddle pad or blanket on you horse's back a little in front of where it should be and slide it back into place. This will ensure that the hair is lying flat. Then, place — don't throw — the saddle onto the horse's back. You wouldn't want someone throwing something onto your back if you were on your hands and knees. While few people can afford saddles custom built to their horse's anatomy, you want to find an "off the rack" saddle that spreads it's weight over a large area while leaving room for movement of the spine — especially the withers. Also, the saddle should not be so long it interferes with the action of the horse's hips. As you tighten the girth, be sure not to pinch the skin. I like to check several times as I'm tightening to make sure the skin doesn't double up. Don't let the girth crowd the front legs. I don't like things digging into my arm pits, and I'm sure a horse doesn't like something digging into the area between his barrel and legs. As you tighten the girth, remember: you don't have to get it extremely tight when first saddling. Just snug it up. Then, walk your horse to the mounting area, and before mounting, check and tighten the girth again. You might be surprised how loose it is after walking a few feet. This is a polite way of doing the same thing as kneeing the horse to make it expel any air when you're saddling. Don't get in a hurry when bridling. You probably don't appreciate people trying to force things into your mouth, so why should you expect a horse to like it? If you're tall enough, you can do what I like to do. 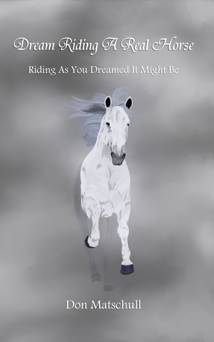 I rest my forearm on the horse's head and let the headstall lie gently on the back of my fingers. Even if you're not tall enough to do that, you still want to be careful when inserting the bit. Simply bring the bit up to your horse's mouth. Don't try to shove it in. Don't even push it against the horse's teeth or gums. If your horse doesn't willingly open his mouth, slip your thumb into his mouth between the front and rear teeth. When he says, "Yuck," simply slip the bit into the opening provided trying not to knock the teeth as you do so. If a horse has had a bit forced into his mouth, he may not be anxious to take the bit willingly. Be patient. If you take your time, the process is bound to get easier. If you rush, it will probably be harder the next time. Some people say the length of a bridle's cheek pieces should be adjusted so the bit causes one or two wrinkles in the corners of the horse's mouth. Others say there should be no wrinkles. What you really want is for the bit to be high enough that the horse need not constantly work to keep it in the right place. Neither should it be so tight that it causes discomfort. I feel the tension of the cheek pieces against the sides of the horse's head, There should be only a slight play. A curb bit should be adjusted so that the bit lies in line with the horse's chin groove. The lower portion of the shank should be no more than twice as long as the top portion and any port should be proper for the size of the horse's tongue and the height of his palate. 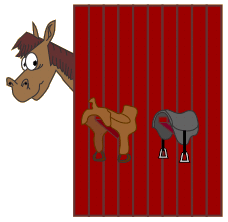 Any bit should be wide enough not to pinch a horse's mouth but not so wide as to slip to one side causing uneven pressure on the bars of the horse's mouth. Adjust the throat latch so there is room for at least a couple of fingers between the leather and the horse's throat. You don't want it putting pressure on his throat when moving. If your bridle has a nose band, adjust it tight enough to look good but loose enough not to cause discomfort. The nose band should not be used to tie a horse's mouth shut. You should strive to make your horse's tack as comfortable for him as you would want anything put on your body to be for you. 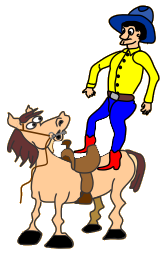 We've all seen the movie cowboy who jumps off the hotel balcony onto his horse's back. When I was a child, I thought that was a neat way of mounting a horse. Now that I know better, I wince every time I see it. When I was a child, all I thought about was the action. Now, I'm concerned for the welfare of the horse. A horse can encounter great trauma without necessarily sustaining permanent damage. If this were not true, horses couldn't well survive living in herds where they encounter biting and kicking from other horses. But why subject a horse to more stress than necessary? Few people actually jump onto their horses from buildings. But I have seen plenty of people plop down on their horse's back when mounting. Why? It takes little extra effort to sit down lightly. I always ask riders how they would like someone plopping onto their back if they were on their hands and knees. We could all probably survive the discomfort once in a while. But what would happen if it was done several times a day? Chances are, we would undergo some type of back damage. If you want to have a long, pleasant relationship with your horse, think when you sit. Let your weight down easily as you settle into the saddle. Think of sitting down on an egg trying not to break it. Many people think mounting blocks are for people who are not flexible enough to mount a horse without one. I would ask everyone to think of what happens when you mount a horse by pulling sideways on the saddle as you heft your weight into one of the stirrups. The horse's spine is pulled sideways. I don't know how much damage this will cause. There are too many variables: the size and strength of the horse, the size of the rider, how often the horse is mounted in this fashion. But why take chances? Just be a little more cautious and a little more courteous when there are other options available. When there is a mounting block, use it. There will still be plenty of opportunities to show that you are limber enough not to need it. By using a mounting block, the rider puts much less lateral stress on the horse's spine. If no mounting block is available, there are other options. If I am working with a student, I might stand on the off side of the horse and put weight in the off stirrup to counteract the weight being placed in the other stirrup as the rider mounts. More often, I place my hand against the pommel on the near side of the saddle to try to counteract the force of the rider mounting. If there is nobody to help, look for a slight incline. An old trick used by those riding in the mountains is to place the horse downhill when mounting. This produces the same effect as that obtained by using a mounting block. There are still other things to consider. A rider who gives a little hop when mounting puts much less stress on his horse's spine than one who pulls himself into the saddle. A rider who stands close to the horse when mounting puts less stress on the spine than one who stands a foot or two away when mounting. Remember the effect of levers you learned in physics class? Finally, try mounting from the off side every once in a while. We generally mount a horse from the left (near) side — a carryover from the cavalry when the trooper wore a saber on his left side. If we always mount from the near side, we constantly pull our horse's spine to the left. If we alternate this with mounting from the off side, we will mitigate the stress on our horse's spine. This will help build our own flexibility as well. And remember: no matter how you mount, sit down gently.